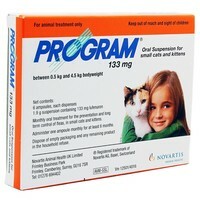 Program Suspension 133mg for Small Cats and Kittens is for the prevention and lasting control of flea infestations in cats and kittens weighing between 0.5 and 4.5kg. Effective against the dominant flea species Ctenocephalides felis and C. canis, Program Suspension can be administered to all cats including pregnant and lactating queens, and kittens (except those which are not full weaned or weighing less than 0.5kg). Each ampoule dispenses 1.9g suspension containing 133mg Lufenuron. Please Note: Program does not kill adult fleas and works by preventing the development of flea larvae.